SmartAsset looked at America through a number of personal finance lenses over the past year. We crunched data to find the best cities to get out of debt and the cities where homeowners save the most on taxes. We did analyses where finance was only part of the equation, like the most affordable beach towns in America or the best cities for millennials. We also analyzed the job market to see where workers are succeeding, for studies like the best cities for women in tech and the best cities for pay in STEM jobs. In looking back on the year, we realized that some cities were consistently popping up in the top 10 in our studies and we wanted to highlight them. Below we rank SmartAsset's best cities of 2016. The best of the best, if you will. To create this ranking we looked at data on all our studies in the past year which focused on cities. We counted the number of top 10 appearances each city had and rewarded them with points based on their rankings. Cities with higher rankings received more points than cities with lower rankings. To get a better understanding of how we put all the data together and where we got it, read our methodology section below. Madison dominated - Madison, our pick for the best city of 2016, finished with a commanding lead. It ranked eight points higher than Anchorage, the second-place city. And it finished 14 points above the third-place finisher Orem. No single region stood out - Although Madison was the standout city, the top 10 is pretty evenly dispersed throughout the country. 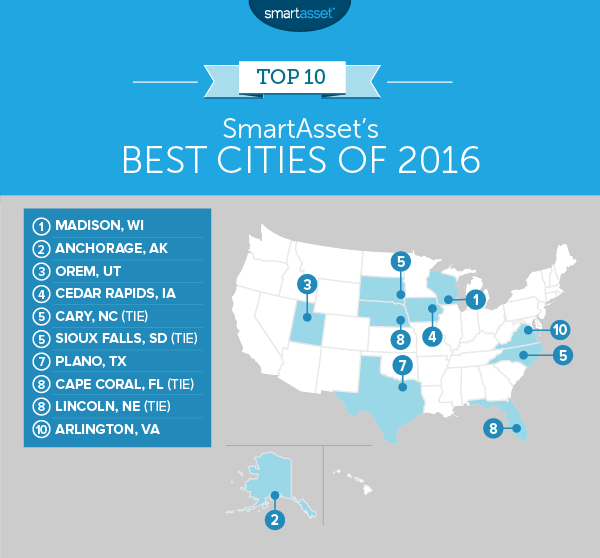 Madison, Wisconsin is SmartAsset’s top city for 2016. Throughout the year Madison scored well in studies which focused on quality of life, like the most livable cities in the U.S. and the least-stressed cities. As a college town, Madison also ranked highly in our studies focused on younger populations like the best cities for teens and the best college towns in America. Overall, Madison ranked in more studies than any other city. Check out current mortgage rates in Wisconsin. Anchorage ranked well in many of SmartAsset’s studies focused on economic factors. Anchorage ranked as the best city to get out of debt and the second-best city to pay off student loan debt. Anchorage also took second place in our study on the hardest-working cities in the country. Plus, if you are looking to experience the great outdoors, Anchorage is also one of your best bets. If Orem, Utah is not on your radar, it should be. With a population of only 91,000, it is the smallest city to make the top 10 but that didn’t stop it from ranking well in multiple studies. Orem is a great city for families. It ranked first in SmartAsset’s best cities for working parents and second for multi-generational households. It is also one of the best places for trick or treating, which is certainly a family-oriented activity. Cedar Rapids ranked well in many of our studies this year because of its affordability. The second-largest city in Iowa is one of the most affordable places for renters and one of the cities where millennials are buying homes. We also named Cedar Rapids one of the best cities for living the American dream, in part because of its high homeownership rate. More than 71% of Cedar Rapids households own their homes. Related: Should you rent or buy? Cary, North Carolina did well in our studies because of its high quality of life and booming economy. Cary ranked first as the fastest-growing boomtown and is the fourth-most popular spot for millennial homebuyers. What separates Cary from some other boomtowns is its safety. Cary is the eighth-safest city in the country, according to our data. Sioux Falls ranked highly in studies where affordability was a key factor. Sioux Falls is the least housing-burdened city in the country. According to Census Bureau data, only 4.3% of Sioux Falls residents can be considered housing cost-burdened. Sioux Falls was also the ninth-best city for millennials, where the percent of income spend on rent was an important factor. Plano, Texas is definitely a city more people should be paying attention to. We ranked it as one of the most undervalued cities in the country and one of the most livable cities. Also, Plano is an excellent place for workers. Its unemployment rate is below 6% according to the U.S. Census Bureau. We ranked it as one of the hardest-working cities and one of the best places for women in tech. Cape Coral, Florida did well in many of our studies because of how affordable it can be. Cape Coral was one of the top 10 cities where millennials are buying houses and it is one of the main destinations for retirees. Retirees are probably attracted to the fact that Florida has no state income tax rate and nice weather. Our data showed a net migration of 1,400 retirees to Cape Coral, the second-most in the country. Lincoln stood out this year for its hard-working population, and as a good city for younger generations. SmartAsset ranked Lincoln as the third-hardest-working city in the country. We estimated that the average Lincoln resident works 1,205 hours per year on average. Lincoln was also the fourth-best city for working students and the seventh-best city for teens. 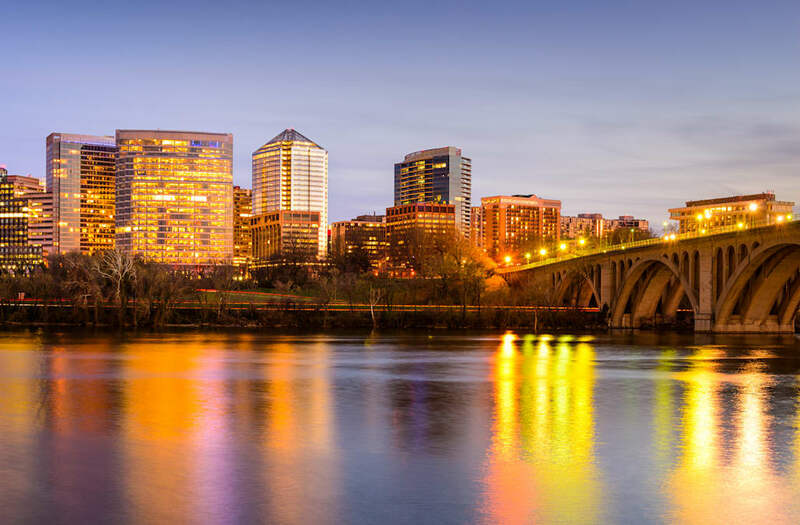 Arlington, Virginia rounds out SmartAsset’s best cities for 2016. Like Anchorage before it, Arlington did well in studies related to opportunity and work. It was the hardest-working city in the country, beating Anchorage for the top spot and was the second-best city for millennials. Arlington also ranked second in our best cities for green families study.